Antibody-drug conjugates (ADCs) are a type of targeted therapy, used most notably for cancer, and consist of an antibody (or antibody fragment) linked to a payload drug which is often cytotoxic. Because of the targeting, the side effects should be lower and give a wider therapeutic window. By combining the unique targeting of antibodies with the cancer-killing ability of cytotoxic drugs, ADCs allow sensitive discrimination between healthy and diseased tissue - leading to widespread enthusiasm in the oncology drug development community. Providing practical and proven solutions for ADC drug discovery success in oncology, "Antibody-Drug Conjugates: Fundamentals, Drug Development, and Clinical Outcomes to Target Cancer" helps readers improve the drug safety and therapeutic efficacy of ADCs to kill targeted tumour cells. 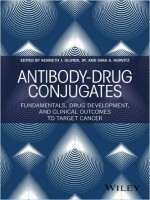 Featuring contributions from highly-regarded experts on the frontlines of ADC research and development, the book covers the basics, chemistry and manufacturing (CMC) controls, nonclinical pharmacology and toxicology, clinical outcomes and regulatory approval strategies, and case studies from oncology drug discovery. Readers benefit through gaining an improved understanding of ADC fundamentals, strategies for targeted and tailored drug release, computational modelling practices, and insights into optimizing and assessing nonclinical studies and regulatory strategies. In addition, the chapters offer discussion on the conduct and design of oncology clinical trials, using ADCs to image tumours and guide clinical protocol development, and therapeutic regimens. Considering how expansive the field is and the potential benefit to researchers, clinicians, and - ultimately -patients, this comprehensive book with the newest cutting edge information offers a critical resource and reference for the growth of oncology drug development.